Sleep is perhaps the most critical human activity for well-being, but seldom receives the priority it deserves. We get less rest than we need, and the respite we do achieve is often not in proper or comfortable postures. 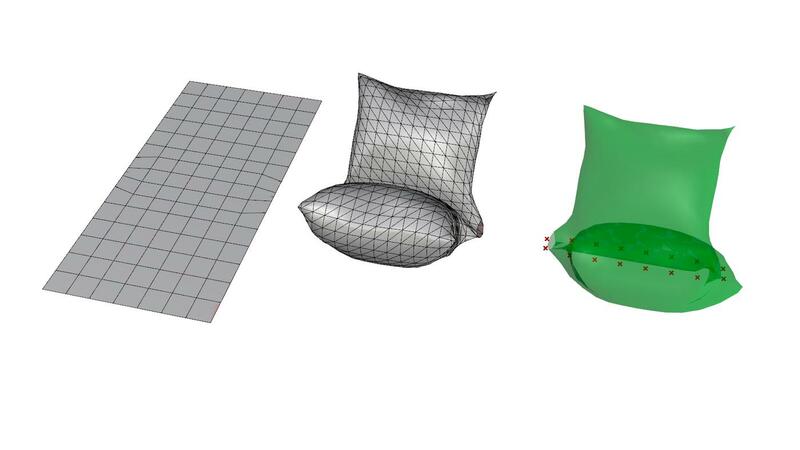 We present a smart pillow “RePose” to explore a new genre of soft, shape-changing auto-adaptive furniture. This new class of interactive "Smart Furniture" device themed around pillows, couches, and beds are designed to transform for, conform to, and inform the user as they rest. Using inflatable pouches and pressure-sensors, RePose detects uncomfortable or unergonomic usage and changes its shape and stiffness accordingly to promote good posture. 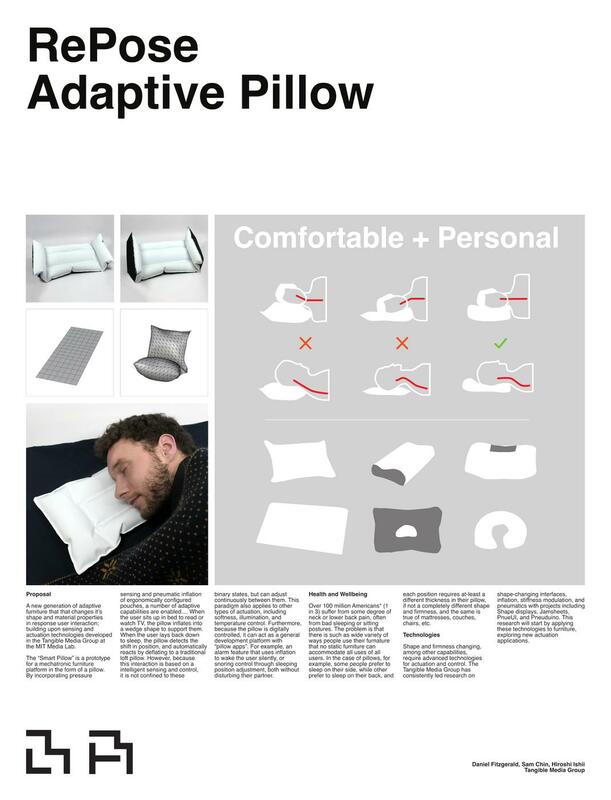 The result is a pillow that is comfortable for everyone in every situation, and is capable of a variety of additional functionalities for sensing and actuation. Humans spend about a third of their lives sleeping. It is crucial for brain development, memory formation and learning. Sleep deprivation has been correlated with weight gain, poor mood, and reduced cognitive ability. Even with such obvious benefits, sleep is often the first sacrifice made in our busy lives. Therefore, it is now more important than ever that we maximize the restfulness of the sleep we do get. A frequent cause of sleep loss is musculoskeletal discomfort from poor neck and back support. This pain does not necessarily only affect sleep - it can lead to poor posture and chronic daytime pain as well. Over 100 million Americans (1 in 3) suffer from some degree of neck or lower back pain, often caused or exacerbated by bad sleeping or sitting postures. Our posture is heavily influenced by the furniture we use and how we use it. However, a single piece of furniture may be used in so many ways that, without actively adapting, it cannot perform optimally for all of them. In the case of pillows, the prime example, some people prefer to sleep on their side, while others prefer to sleep on their back, and each position requires at-least a different thickness in their pillow, if not a completely different shape and firmness, or there is a higher chance of discomfort and misaligned spine. A supportive and comfortable pillow can relieve musculoskeletal strain and prevent these negative outcomes. The same is true of mattresses, couches, chairs, etc. Previous studies have investigated the ideal form of pillows. Shapes that follow the cervical lordosis curves of the neck and upper back are most optimal. Most of the pillow designs investigated prioritized cervical spine (neck and upper back) support in specific positions - they were designed either for side or back sleeping. Many were even custom designed, but did not address the fundamental fact most humans shift positions while sleeping. Pillows designed for a single position rarely support the neck adequately when sleeping in the alternate position. This “Smart Pillow” is a prototype for a mechatronic furniture platform in the form of a pillow that aims to morph between different pillow designs. By incorporating pressure sensing and pneumatic inflation of ergonomically configured pouches, a number of adaptive capabilities are enabled. 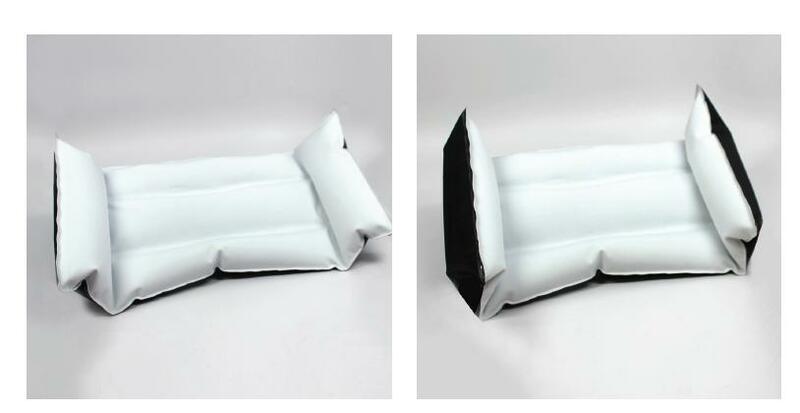 When the user sits up in bed to read or watch TV, the pillow inflates into a wedge shape to support them. When the user lays back down to sleep, the pillow detects the shift in position, and automatically reacts by deflating to a traditional loft pillow. However, because this interaction is based on a intelligent sensing and control, it is not confined to these binary states, but can adjust continuously between them. This paradigm also applies to other types of actuation, including softness, illumination, and temperature regulation. Furthermore, because the pillow is digitally controlled, it can act as a general development platform with “pillow apps”. For example, an alarm feature that uses inflation to wake the user silently, snoring control through sleeping posture adjustment, or active prevention of specific sleeping positions.